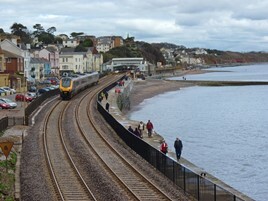 Delivering resilience improvements for the Devon Sea Wall is “a national priority”, says Prime Minister Theresa May. Pollard asked May to unblock a £300 million upgrade that he claimed the Department for Transport was sitting on, and use the anniversary of the wall’s collapse (RAIL 742) to keep the line open and stop it being “fragile and precarious”. To read about what has happened in the five years since the collapse, read RAIL 871, available now.